Sunday afternoon Connie and I were on the phone when I received a call from our Stranding Hotline about a whale that was stuck on a sand bar in Katama bay on Martha's Vineyard. After abruptly hanging up on Connie I called the reporting person and the "fun" began. The whale was about 500 yards north of Norton Point in a shallow region. The caller could see the animal raising and lowering its fluke however it remained stationary in the water. Fortunately Kate and Kerry were on the island conducting a field volunteer workshop. They responded immediately and were able to verify and identify the animal as a humpback whale. The original caller described an entanglement situation with gear attached to the tail. Because of the distance from shore they were unable to tell if the animal was entangled or had any outward injuries. Paul Bagnall the Shellfish Warden from Edgartown took them out in a skiff for a health assessment and entanglement determination. Under the Aquarium's permit they did a close approach and were able to determine that the animal was not entangled and that there were no outward injuries. Eventually the team had to leave the animal because it was too dark to safely try any intervention with the whale. We were all hoping for the best but preparing for the worse. The following morning at daybreak Kate and Kerry headed out once again to try and find the whale. Along with volunteers Dave and Shari Grunden and several shellfish department staff, they searched the area but did not relocate the animal. 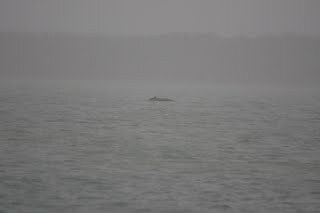 As everyone was being dropped off at the dock a report came in of a small humpback whale swimming around Edgartown harbor. So back on the boat and off they went again. After about an hour of searching, they located the whale outside the mouth of Edgartown Harbor. They observed the animal's behavior, collected respiration data (breaths), and did a visual health assessment. From their observations this animal was engaging in surface behavior typical of juvenile humpback whales. These behaviors included tail lobbing, tail slapping and possibly one breach. The animal was swimming well and was not emaciated. Photographs of this whale have been forwarded to the Whale Center of New England and Provincetown Center for Coastal Studies to see if they can match the photos to known whales in the humpback database. Hopefully this little whale enjoyed its stay on the Vineyard but won't return to Katama Bay. Orion, a Kemp's Ridley sea turtle and the last of our in-house 2008 cold stunned animals, made its way back into the Atlantic Ocean yesterday. The last CT scan on the turtle showed improvement to the lung which had a severe pneumonia. Orion has been eating and swimming well for awhile. After a final exam the turtle was deemed able to be released. With the colder months approaching, we decided to bring Orion a little further south than the others that we released at the end of August. So we loaded the turtle up early yesterday morning and drove down to Long Island to release Orion back into the Atlantic Ocean. This will give Orion a slight advantage over Goose who, at this time, is getting closer to leaving Long Island Sound and Orion should be in about the same area as the other Ridleys we released from Dowse's Beach. We were able to release the turtle with the help of our colleagues at The Riverhead Foundation for Marine Research and Preservation. 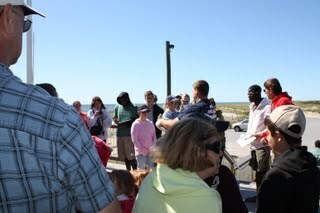 We helped kick off their beach cleaning effort on International Beach Cleanup Day at Ponqougue Beach in Hampton Bays. We would like to thank the awesome group at Riverhead for providing such a lovely day and beautiful beach to send Orion home! Also a big thank you to the great people at the Cross Sound Ferry for all your help over the past turtle season!